Advanced Foot & Ankle Clinics (Kent) - Book Appointment Online! 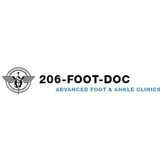 Advanced Foot and Ankle Clinics offer the highest quality podiatry care and breakthrough laser treatment for patients suffering from a variety of foot problems. We combine knowledgeable and honest doctors with the most advanced technology in the northwest to treat diabetics, sports injuries, arthritis, skin conditions and much more. We’ll answer all your questions about laser fungus treatment, diabetic podiatry care or anything else you’d like to know. Larger health problems are often revealed through the feet, that’s why our exceptional physicians conduct a thorough diagnosis to get you on the path to complete health. Serge and Ilona Barlam graduated from New York College of Podiatric Medicine, one of the oldest and most respected podiatric schools in the U.S. During their tenure, the doctors worked in the largest podiatric clinic in the world, located on school premises.